These super quiet sport slotted brake rotors feature the new EBC narrow profile slot pattern designed to help cool and de-gas brakes under load and speed while eliminating air noise. Coated with Black zinc finish, the EBC USR series of sport brake rotors are complete with bearing cups where fitted as OEM. The best-in-class brake rotor for a premium sedan, the EBC USR series slotted brake rotor is British made and precision machined in the UK. Designed for drivers who desire improved sport braking with minimal air noise, the EBC USR series creates a quiet running sport rotor that still has benefits of removing gas, dirt, water and debris and maintaining parallel pad wear. An excellent sport rotor for your car's brakes. An exciting feature of slotted rotors is the way they maintain flat and parallel pad wear and avoid the record grooves or galling common with non-slotted rotors. 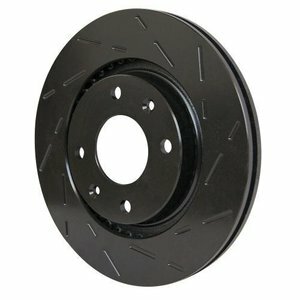 Slotted brake rotors improve pad contact and braking throughout the life of the rotor and pad set. When used with a higher friction brake pad, the EBC USR series of brake rotors will deliver better brakes every time! EBC brake rotors reduce brake fade at speed. Sold and priced in sets of 2. Pairs perfectly with a high friction EBC Redstuff Brake Pad, EBC Yellowstuff Brake Pad or the EBC Greenstuff Brake Pad. The Pep Boys Say: "Brake Rotors should be resurfaced or replaced with every brake job."